Captain Marius Nevarre is the noble and capable commander of the Fourth Company of the Knights of Altair. 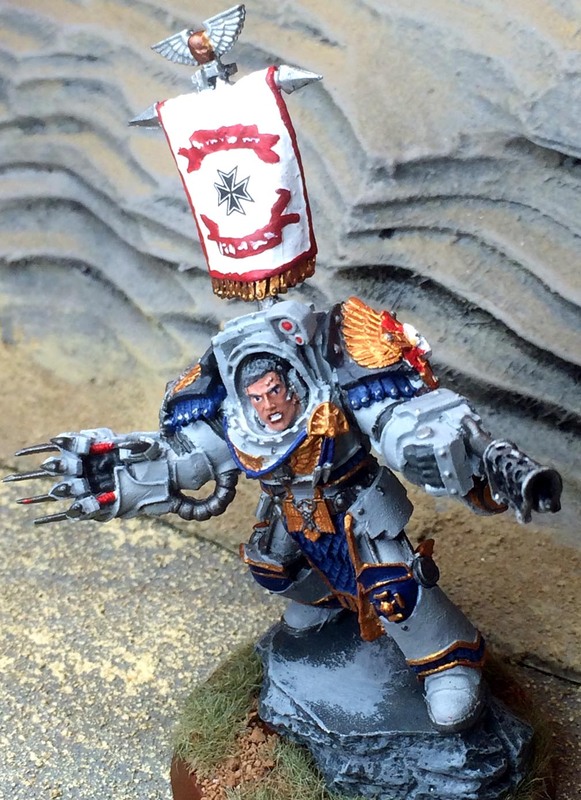 Marius Nevarre is captain of the Fourth Company of the Knights of Altair, a Space Marine chapter that defends a significant region of the Segmentum Ultima. Nevarre is the living embodiment of all that is admirable in an Astartes: proud, valiant, honorable, loyal, and dedicated to the service of the Emperor. 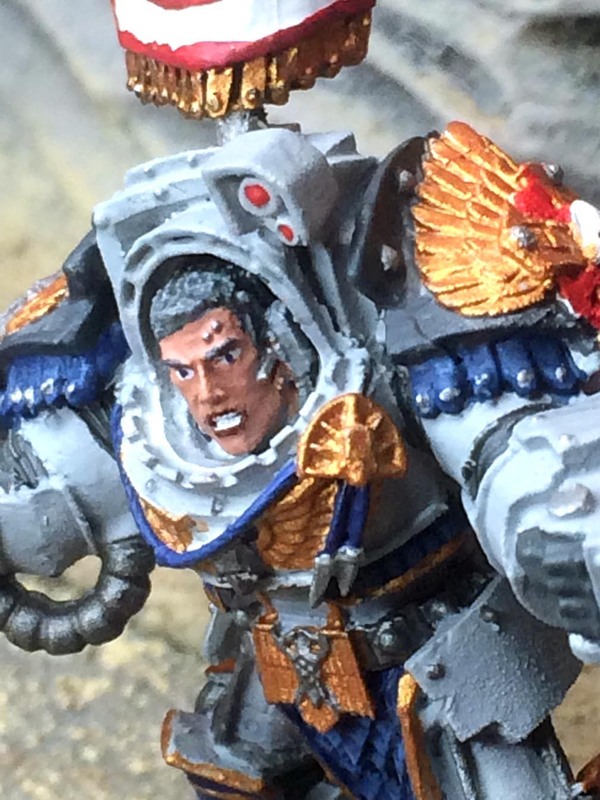 Even for a Space Marine, Nevarre has lived a long and bloody life. His early years were spent in the filth and violence of the underhives of Forge World Helios, where he and his mother were enslaved by a criminal gang and endured years of hard labor. At age 12, Nevarre’s mother died from a brutal beating by a gang member, and the youngster escaped into the sewers—and later offered his allegiance to a rival gang. By age 14, he was an accomplished killer and devoted himself to ambushing his former enslavers. Within two months, half of the gang’s membership was dead. His mother’s killer died a particularly gruesome death. His talent for violence did not unnoticed. Dragged from the underhive by the chaplains of the Knights, Nevarre was taken to the chapter tower on Helios and subjected to intensive testing of his physical and mental suitability—and was accepted as an aspirant. His training continued for a number of years before finally being accepted into a Scout Squad of the 10th Company. His rise through the ranks was swift and steady, as his zeal for battle was balanced by a calculating tactical mind. Except for a touch of gray in his hair—and a prominent facial scar—there is little to mark the centuries of service. His physical prowess at its peak, Nevarre is a consummate warrior, proficient in all weapons. As captain of the Fourth Company, he has been clothed in an ancient set of Artificer Armor—appropriate given the responsibility he wields. Preferring to lead from the rear, then rush into melee at the critical point of the fight, Nevarre is equipped with an ancient, master-crafted Lightning Claw and heavy flamer for close-in fighting. Captain Nevarre is cloaked in Artificer Armor and is armed with an ancient master-crafted Lightning Claw and a Heavy Flamer. ASPIRANT TRIALS (445.M41)—To determine his worthiness to join the Knights, Nevarre and 11 other candidates are taken to the jungles of Darkover to hunt the vicious Chtorr, a three-meter-long arthropod with razor-sharp pincers. Eight aspirants die in the hunt, and only Nevarre returns to the landing zone with a prize. DEFENSE OF TORRENTIA (456.M41) —WAAAGH! Ghurlukh falls upon Torrentia, a lightly populated and rain-drenched world of little strategic value. The Fourth Company is only 20 parsecs away when the planet’s distress call is received, and then-Captain Galerius declares that no world of the Emperor—no matter how insignificant—will be allowed to fall to xenos. The company rushes to the scene. Fortunately, the ork invasion is relative small—only 20,000 greenskins survived their ROK’s crash-landing. In six months of fighting, mostly in the unpopulated jungles at the planet’s equator, the xenos are vanquished. As a Scout, Nevarre is engaged in hundreds of small-unit firefights. By the end of the campaign, the young scout counts 1,473 kills to his credit. BATTLE FOR KANDOR (489.M41)—A Necron tomb ship arrives in orbit around Kandor, ignoring all Imperial attempts at communication and disgorging a fleet of landing craft to a remote region of the planet before disappearing into interstellar space. The Fourth Company intercepts the planet’s distress signal, and what follows is a guerilla-style war fought over a barren landscape of solidified lava beds intermixed with molten lakes of lava. The Necrons are clearly looking for something, and they evade the Astartes at every opportunity. Finally, without warning, the Necron tomb ship returns and the planet-bound Necron warriors simply disappear. Unknown to the Knights, the Necrons are searching for a shard of a C’tan that had fallen to the planet millions of years ago. How the Necrons tracked down the shard to this world—and whether they found their prize before they left—is known only to the xenos. REBELLION OF CASTINUS (513.M41)—After years of isolation caused by Warp storms, the wealthy industrial world of Castinus is reunited with the Imperium. Alas, its leaders are not eager to give up the political freedom they’ve enjoyed for so long, and they’ve forgotten the scope and power of Terra. They demand to retain their independence. Under the command of High Marshall Ioculus, five companies of Knights invade the rebellious world. No one can stand before the Astartes—until the Knights turn on the formidable defenses of the capital city. The Knights are rebuffed with great losses. The city walls are finally breached when Nevarre, now promoted to Battle-Brother, uncovers an overlooked—and undefended—sewer line that leads to the city center. Slipping inside at night, Nevarre joins a two-squad assault of the main city gates—and opens the gates to a vengeful-minded Ioculus and the Terminator-armored vanguard of the 1st Company. The city falls within a day. ALEXANDRIA CAMPAIGN (572.M41)—On the world of Alexandria, Nevarre is part of a tactical squad ordered to defend the main bridge into the capital city. A sizable army of rebels attacks, and after the squad’s Brother-Sergeant is killed, Nevarre takes command. To hold in the face of overwhelming odds, Nevarre uses sniper fire and radio-controlled mines to target the rebels’ leaders. As the ranks of rebel leaders—and newly promoted replacements—are thinned, the rebel attacks become increasingly disorganized and reluctant, and the rebels are unable to make good use of their superior numbers. The bridge is held, despite odds of 400-to-1, until Imperial Guard reinforcements arrive to take over the defense. THE FALL OF MYCHOR (615.M41)—Archon Mychor of the Haunted Blades leads his pirates to the Imperial agri-world of Ararat. The Dark Eldar crush the planet’s small defense force and delight in hunting down peaceful farmers and killing them in the cruelest fashion possible. But Mychor has made a mistake. The Fourth Company is on his trail—and the Astartes corner him. Trapped, Mychor fights with desperate abandon, but his formidable fighting skills are for naught. At the Battle of Bloody Lake, Nevarre saves Captail Garelius’ life when Mychor stuns the captain with a power weapon. It takes both Space Marines to finally bring down the wily Archon, and for his bravery and loyalty, Garelius promotes Nevarre to Brother-Sergeant and assigns him command of his own squad. SLAUGHTER ON THE IMPERIAL BASTION (695.M41)—The Fourth Company enters the Diogenes System to find the Explorator Station Imperial Bastion under attack by the eldar of craftworld Biel-Tan. After a brief void battle drives away two Eldar cruisers, the Knights board the space station to deal with xenos who had boarded the station. The first to enter the station is Brother-Sergeant Nevarre, who leads his tactical squad to the engine room, where he stymies an attempt by the xenos to sabotage the station’s power system into self-destructing. THE BEAST OF TOROX III (707.M41)–Rumors spread across Hive Necros of a shadowy menace that preys upon the mutants and poor laborers who live in the Stygian darkness of the underhives. Although thousands disappear, Imperial authorities have little interest in the underhive—until several members of the hive’s aristocratic society meet a messy end in the elite upper hives. Several teams of Arbites enforcers are sent to hunt down the menace, but when none return, authorities realize they are outmatched. The call for help is acknowledged by High Marshall Ioculus, who decides to test the potential of Brother-Sergeant Nevarre, whose tactical squad is sent to Torox III to deal with this mystery. After several weeks of searching—and several violent encounters with a shadowy form—the menace is cornered and put to death. At this time, however, few in the Imperium are familiar with the creature that later will be known as a genestealer, and the creature’s significance on Torox III goes unrecognized. Nevarre departs the planet, never realizing that this vanguard of the Tyranid menance already has implanted its genetic material into several victims and laid the groundwork for an ever-growing genestealer cult. THE PROMETHEUM WAR (701-704.M41)—The prometheum-rich Sartaka System is scoured of xenos and claimed by the Imperium. The Fourth Company arrive in-system near the end of the campaign, when Nevarre and his men join the rest of the chapter—operating at full strength for the first time in a century—in the epic Battle of Sartaka Prime. GARELIUS’ FALL (725.M41)—Captain Garelius meets his end on Collegia during the Battle for Fermi’s Rift. For two years, the Fourth Company fights against the budding WAAAGH! of Warboss Snarltooth, who eventually marches on the planet’s capital city. Seeking to enter the city along the Emperor’s Bridge, a 2-kilometer span that bridges a deep mountain chasm, Snarltooth and Garelius finally meet in personal combat, as the Space Marine captain decides to “cut off the head of the snake and end this madness.” The two mighty warlords battle for a day and a night, mortally wounding each other before plummeting to their deaths as the bridge collapses during this epic duel. With the death of Garelius, High Marshall Ioculus names Nevarre to take command of the Fourth Company—to the cheers of his comrades who know his worth. EXTERMINATUS OF YA’FOL (729.M41)–The Fourth Company is called upon to put down a Chaos-led rebellion after cultists summon daemons to their cause. The battleground is a nightmare of insanity, with maddened women sacrificing their babies before the ranks of Knights as part of a heretical ceremony to open a portal and allow more Warp-spawn to join the fight. Imperial forces slowly gain the upper hand in the war, but as Warp energies leak through a multitude of daemonic portals, the planet itself begins to mutate—plants, animals, even rocks and soil begin to take disturbing, twisted forms. The air takes on a thick, oily quality, and some Imperial guard troops go mad and must be executed. A secret mission by Captain Nevarre reveals a dangerous new threat behind enemy lines, and he sends a desperate message to the Inquisition. The battle continues for another three months, but when an Inquisitor from the Ordo Hereticus arrives, the order is given for Exterminatus, and the Knights must evacuate the doomed planet. The world is bombarded with cyclonic torpedoes until nothing on the surface remains but molten crust. All records of the incident are expunged from Imperial records, and Nevarre thereafter carries the guilt of his decision to contact the Inquisition. TheGM: I have yet to decide the stats for Captain Nevarre. I think, for a time, I’ll experiment with the stats of a variety of named characters—as well as several variations of a well-equipped generic captain—before deciding on a final incarnation for my new hero. But, unless I opt to replace my captain entirely, he will remain equipped with the weapons of the miniature: Lightning Claw and heavy flamer. Seems like a good combo to me.